All published by Gargoyle Editions. 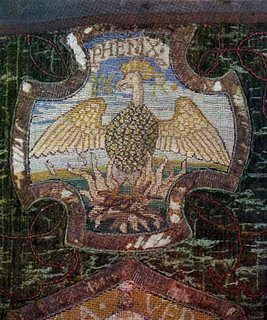 Mary Stuart, Queen of Scots, as a needle-woman, was prolific: during captivity, the embroideries often contained messages to her supporters, with a predominance of puns, a way of multiplying the motif. The mobile and the fixed in a perpendicular twining, embroidery can achieve complex effects. The eight poems in this mini-booklet de-code motifs, and in doing so, find an ineluctable over-coding in the temporal threads between Mary's artistic practice and the present writer writing the hangings, the forms of the poems often shifting sideways, a motif-unravelling "sky blew yelping" made as enjambment-rich poem. The looking-glass is also a medium; a crazed historicized seeing through time, "corsets" hooked to "exocets". (An early Monk poem is "Dream One *** Missiles"). What's a "rigadoon"? A lively, skipping dance; it is where the red and linear tear runs, to dance out what's in. The preface note says: "From Nether Edge to Nether Stowey: two words four hours six counties and one astonished heart jolt away." From the middle of Sheffield to the edge of the Quantocks, a diagonal line towards Coleridge. Give a good knock. Hen?